As an Italian and an ethnic food loving connoisseur, meatballs are definitely on the menu when it comes to Italian cooking at my house. However, I have never completely fallen head over heals in love with the oversized balls of meat that accompany many pasta dishes. 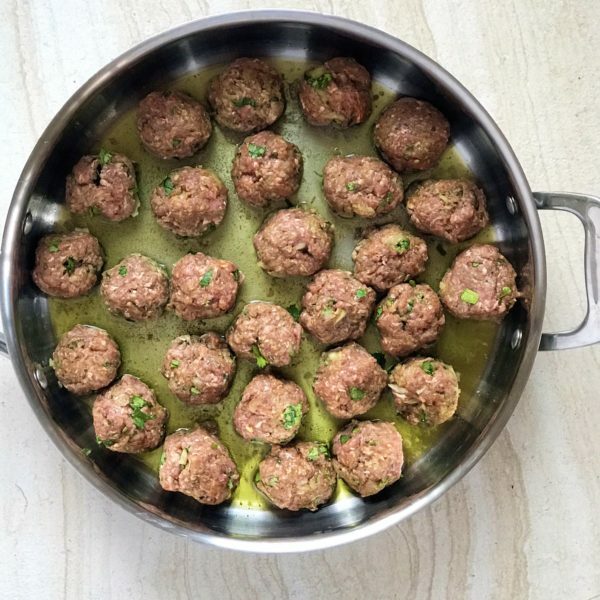 So, when my friend Ameneh, who is originally from Iran, served Persian meatballs called Koofteh, at a dinner party, I was curious to see what the difference might be. As they say in Italian, “Sacri Fumi!” better known as, “Holy Smokes!” they were Magnifico! 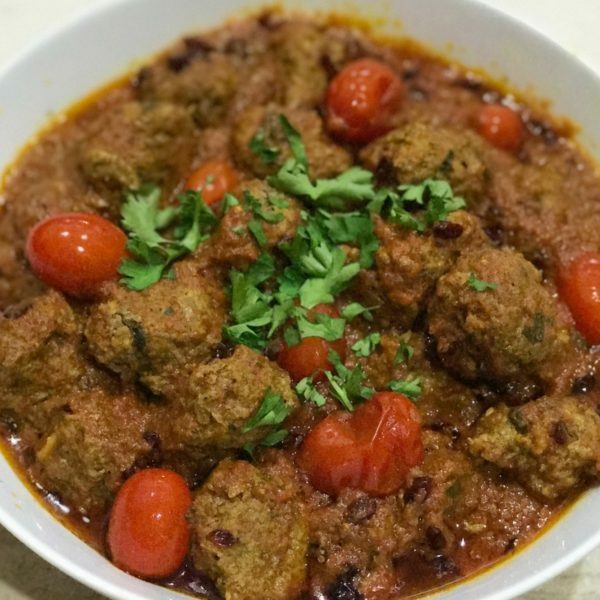 Made with a zesty tomato sauce and infused with a variety of spices and herbs, Ameneh’s Koofteh recipe will make the toughest meatball critique fall in love all over again. Only this time it will be Persian style love. Koofteh in Persian means “pounded or ground” because many years ago in Iran, Koofteh was pounded with a large pestle and mortar to give the meat a sticky texture that held it together when cooked. 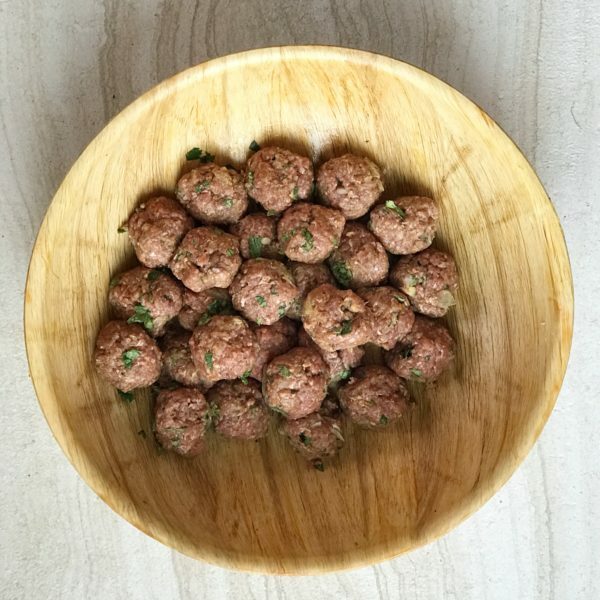 Many cultures around the world have their version of Koofteh made with a variety of spices, herbs, and other ingredients that make the meatballs culturally unique from one another. One of the ingredients that makes this recipe so amazing are the barberries. You can order them here since they are hard to find at local grocery stores. You can also use the barberries for my Garlic Green Beans with Shallots & Barberries recipe. 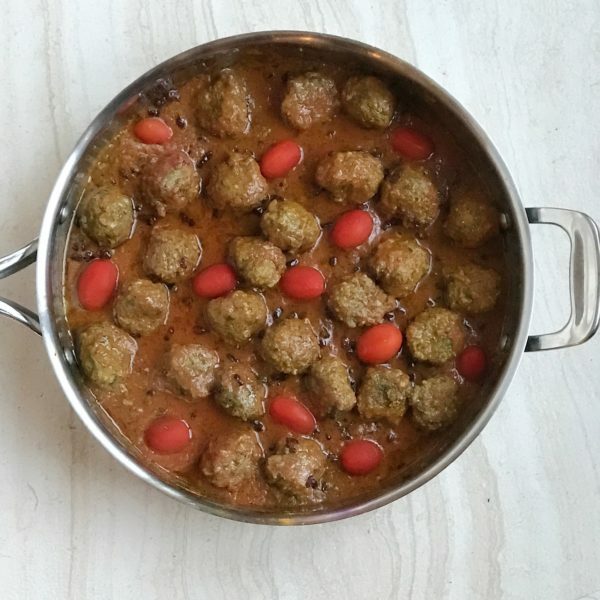 A combination of zesty tomato sauce combined with sour lemon and barberries and a slightly spicy kick gives these meatballs an irresistibly unique flavor that will keep you wanting more. Finely chop onions in food processor and set aside. In a large bowl, mix ground beef, onion, cilantro, turmeric, 1 teaspoon salt, sumac, coriander seeds, and cayenne pepper. 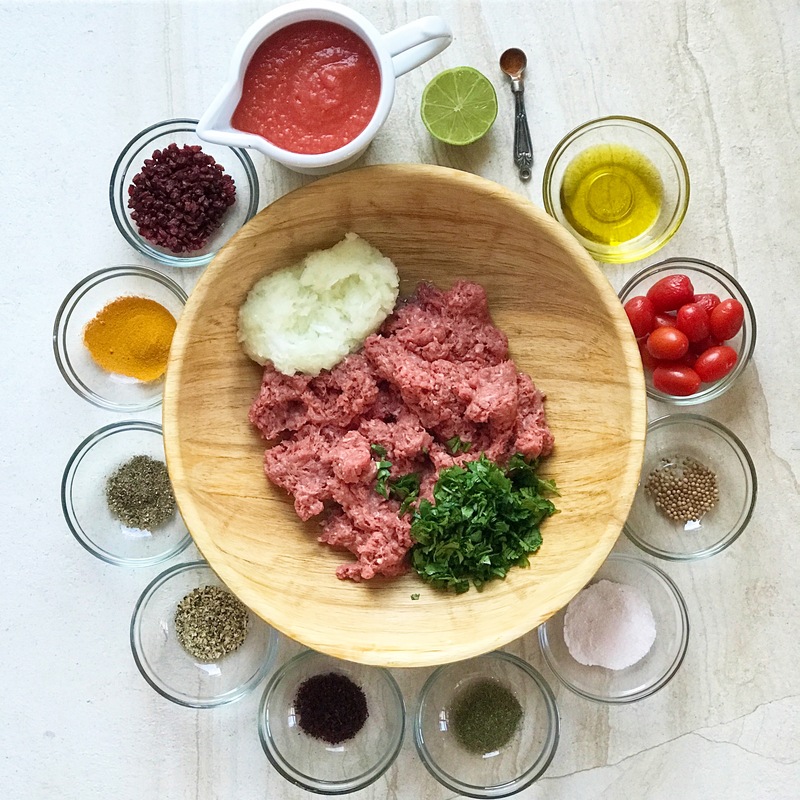 Form ground beef into small 1-inch cocktail size meatballs and set aside on plate until all meatballs are formed. Heat olive oil in large sauté pan over medium heat. Add meatballs in batches if the pan isn’t large enough. Do not overcrowd the pan. Brown meatballs on all sides. While meatballs are cooking, evenly sprinkle remaining 1 teaspoon turmeric and 1/2 teaspoon lemon pepper. Pour lime juice over meatballs, reduce heat to medium-low and simmer for 10 minutes. Pour tomato sauce over meatballs and add cherry tomatoes, distributing evenly in pan. Sprinkle sauce with remaining 1 teaspoon salt, 1 teaspoon dried dill, remaining 1/2 teaspoon lemon pepper, and a light sprinkle of turmeric. Evenly sprinkle barberries over sauce. Reduce heat to low. Cover and let simmer for 10 minutes. Transfer meatballs and sauce to a large serving bowl. Serve hot with basmati rice and a salad. Be generous with the turmeric. There is no such thing as too much turmeric in this dish. My Koofteh is a traditional Persian Meatballs dish with a French influence. Lemon pepper is a flavor I use in my recipes often. That’s what sets my Koofteh apart from other traditional recipes. Using 80/20 beef keeps the meatballs tender. Using leaner beef gives the dish a much drier texture and taste. I think this recipe should I try soon. I made these tonite for my family. I was craving a Persian kofteh recipe when I found yours on the internet tonite. Instead of beef I used ground lamb. The combination of these seasonings, spices and lamb was simply amazing. My husband said it was one of the best sauces he’s ever tasted. I can’t wait to try it out for a party but first wanted to test a small batch on my family. This was a hit! We are cutting back on gluten in our house so I served it with Spaghetti Squash instead of rice. The combination was wonderful. Thank you for sharing your delicious and mouthwatering recipe. PS. If folks decide to make this recipe with ground lamb, be sure to discard the extra fat that comes from cooking the lamb meatballs. I removed several large spoon full’s of fat during each stage of simmering and that was a good move and help the sauce thicken during simmering.. Thanks for your kind comment. I am so happy you gave the Kofteh recipe a try! I love hearing how the recipes work for my readers and am super happy you and your family loved it! The lamb option sounds delicious too. I am a huge fan of lamb and try to use it in my recipes whenever possible. The next time I make Kofteh, I will give your suggestion a try. Thanks for the tips on how to best substitute the meats as well. That is very helpful. Happy Thanksgiving to you and your family. Thank you for sharing your comment! I am so happy that you and your guests loved the Koofteh recipe! Wishing you a Happy Birthday! I loved the flavor of the meatballs for this, but my sauce tasted more like it was made for pasta. I think my main issue was the tomato sauce. I just used a standard tomato sauce from the store. Would diced tomatoes, tomato puree or something else change the flavor here? Because of the combination of turmeric, coriander, sumac, lemon pepper, and barberries, the sauce should be quite zesty and not too similar to pasta sauce. One idea is to increase the turmeric and lemon pepper sparingly until you achieve the flavor you like since the main character of this sauce is created to be a bit on the sour side from the lemon pepper and barberries. Diced tomatoes would change the flavor and the texture and tomato puree would make it too thick. I might suggest trying a different tomato sauce. I usually use the Wholefoods brand of tomato sauce when I make this. I hope that helps. Please let me know if you have further questions and how it turns out if you make it again! Elizabeth Iradjpanah aka Liz I. Thank you for your recipe. I’ve been married for 47 years to an Iranian. My Mother-in-Law,used to make Koofteh, but she made Large ones. They were amazing. Sadly, she has pass away, and I never learned how to make them. My husband makes them and there really good, but he use’s Zeh reshk. Maheen June, made them with some kind of fruit in the middle. Learned how to make many Iranian dishes from her but not Koofteh. Would Love to surprise my family with that recipe. Dast deh shomah dard nakoneh. Thank you for sharing your beautiful comment. I am sorry to hear of the loss of your Mother-in-law. My mom passed away a few years ago and thankfully I was able to learn most of her recipes. I love the idea that you are going to surprise your family with koofteh! I am sure they will love the sentiment! Please keep me posted on how it goes and thank you for vising my blog!